Unitrade lists four varieties of the untagged stamps, three of which are very scarce, and does not list any plastic flow varieties, even though they clearly do exist on the untagged PVA gum printings, as well as on the dextrine gum printings. I have started to use the term dextrine rather than dextrose after David Gronbeck-Jones, the famous Centennial issue specialist and author pointed out to me that dextrose is the sugar from which the dextrine gum is made. The tagged stamps are listed by Unitrade as existing with both Winnipeg tagging and General Ottawa tagging, on both dull and low fluorescent papers, for a total of 4 basic varieties. All of these exist, of course with plastic flow varieties. According to Unitrade, the general tagged stamps were the first to appear, in February 1972, followed by the Winnipeg tagged stamps in March. All of the untagged stamps are given as being issued in 1972, but no exact date has been given for their issuance. In the absence of compelling evidence to the contrary, I would assume that they should have been issued at the same time as the tagged stamps on comparable paper. The remainder of this post will examine the differences in paper, shade, perforation and gum that can be found on these stamps. 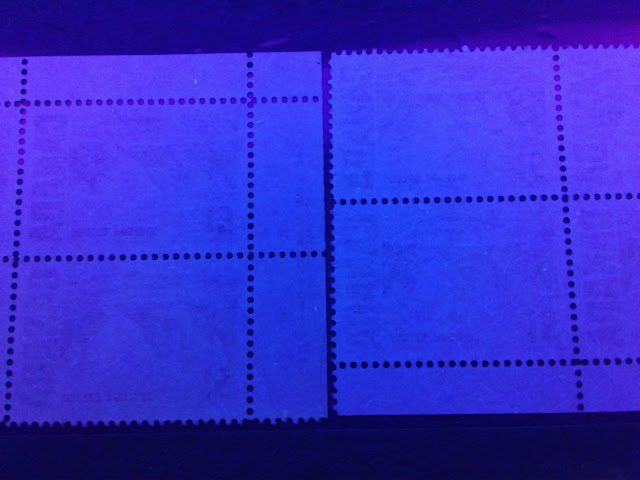 A vertical wove paper that shows no ribbing, either on the front or the back, and which shows no mesh pattern when the stamps printed on it are held up to strong back lighting. There is a light surface coating on the paper that is visible without a magnifier, as a highly burnished printing surface. A horizontal wove paper that also shows no ribbing. However when held up to a strong light, a series of closely spaced horizontal striations can be seen. A horizontal wove paper that also shows no ribbing. Unlike the second type above, this paper shows no mesh pattern when held up to a strong back light. A vertical wove paper that has very clear vertical ribbing on the face. There is a very light surface coating that prevents any stray fibres on the paper surface. When held up to strong back lighting, a very strong vertical mesh pattern is visible. From what I can see first type of paper seems to exist with low levels of fluorescence. The second type seems to be confined to the fluorescent papers. The third type also is found with low fluorescence and dull fluorescence. The fourth type seems to exist only with dull fluorescence. 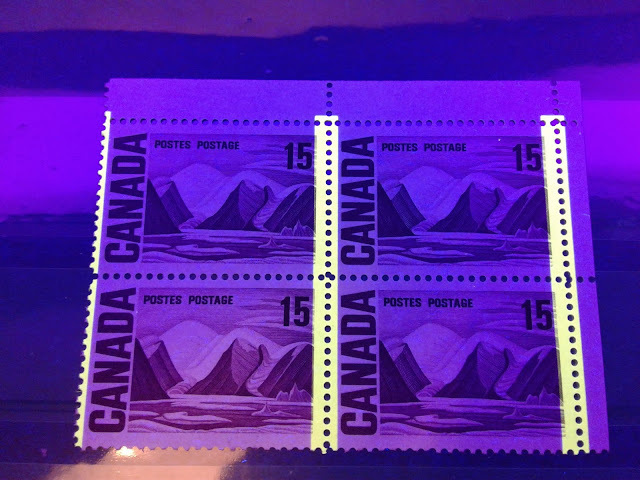 Unitrade lists three levels of fluorescence on these stamps: fluorescent, dull fluorescent and low fluorescent. There is a lot of confusion that can arise when trying to sort the stamps for the first time, given that the fluorescent paper is the common one and is worth a lot less than the low and dull fluorescent papers. Another point of confusion is that both flecked and non-flecked versions of the papers exist. The final point of confusion is that the flecked versions of the low and dull fluorescent papers are not really that at all, but non-fluorescent paper that contains enough fluorescent fibres to make the paper appear dull fluorescent or low fluorescent overall. The so called low fluorescent paper is shown on the left block, while the fluorescent paper is shown by the block on the right. The difference is unmistakable. The fluorescent paper, as you can see has a bluish white colour that at first appears to be uniform. Upon close examination with a loupe, one can generally see that this paper is actually a flecked paper in which the florescent fibres are overshadowed by the inherent fluorescence of the paper. In contrast the dull fluorescent papers or low fluorescent papers appear shades of dark blue or violet under the UV light. This paper shouldn't exist tagged, but of course anything is possible with this issue. Once you have seen this difference though, it should be reasonably easy to pick out those on fluorescent paper. Then you can focus on differentiating the different varieties of fluorescent paper and then sorting the dull from low fluorescent paper. The paper described here is shown on the right. 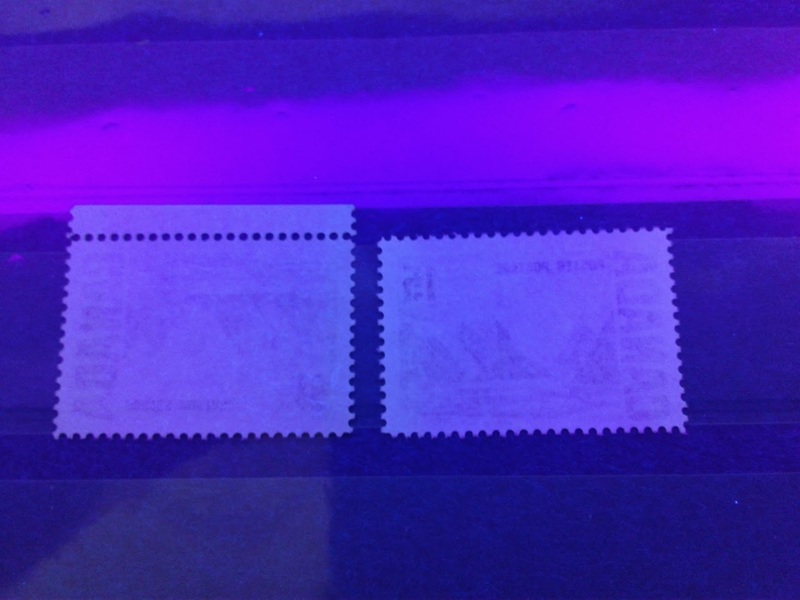 The stamp on the left is one of the low fluorescent papers, that contains the low fluorescent fibres. 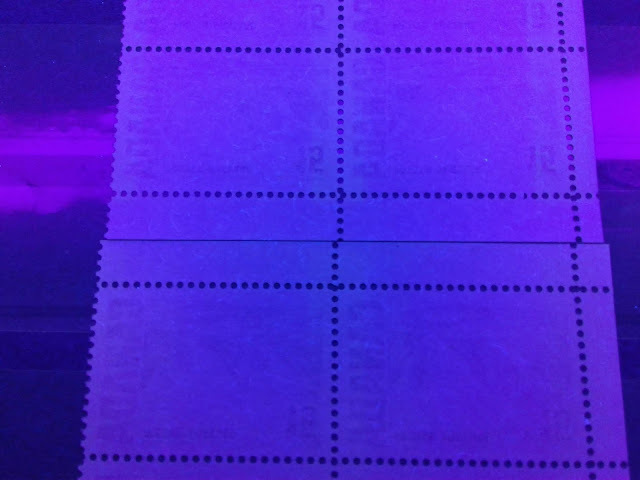 A dull fluorescent violet grey paper under UV. The paper contains a low density concentration of low fluorescent fibres, a sparse concentration of medium fluorescent fibres and a very sparse concentration of high fluorescent fibres, which together make it appear low fluorescent. 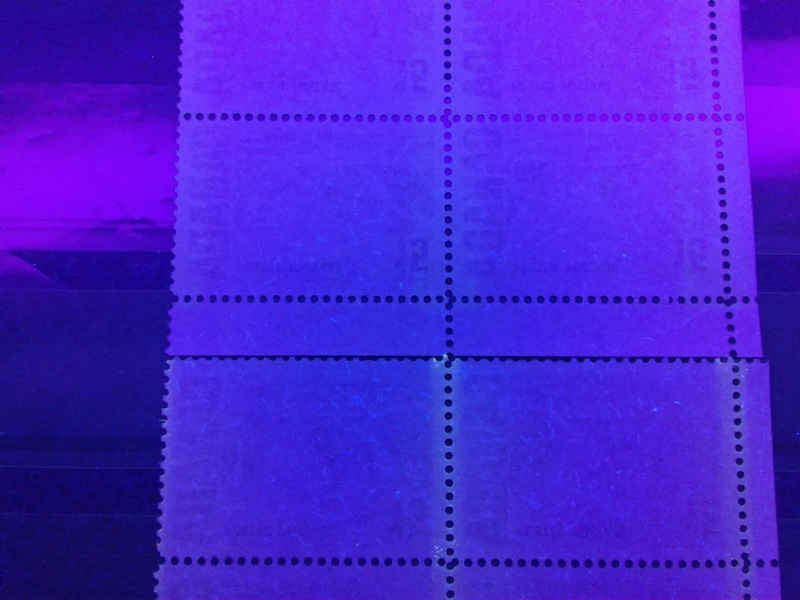 A dull fluorescent grey paper under UV. The paper contains a low density concentration of low fluorescent fibres, and very sparse concentrations of medium and high fluorescent fibres. 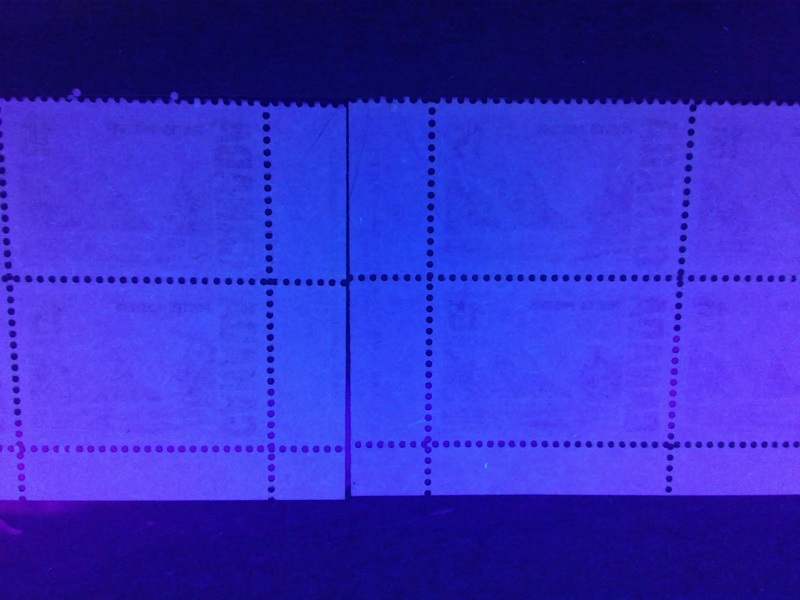 A dull fluorescent grey-blue paper under UV. This paper contains sparse concentrations of low, medium and high fluorescent fibres, as well as very few hibrite fibres. The first type of paper is shown in the top block, while the second type is shown on the lower block. if you compare the top and bottom selvage tabs on each block you can see that the top block is noticeably brighter than the bottom block. These are of similar brightness, but as you can see there are more fluorescent fibres in the bottom block, compared to the top block. Dull fluorescent light blue paper that contains a low density concentration of low fluorescent fibres, a sparse concentration of medium fluorescent fibres and very few high fluorescent fibres. There are also very few brownish woodpulp fibres in the paper. Dull fluorescent bluish white paper that contains a low density concentration of low fluorescent fibres, a very sparse concentration of medium fluorescent fibres and very few brownish woodpulp fibres. Low fluorescent bluish white paper that contains a low density concentration of low fluorescent fibres, a very sparse concentration of medium fluorescent fibres and very few high fluorescent fibres. As you can see, the two types look very, similar overall. The only difference really is the colour under UV, with the right block being bluer than the block on the left. Here you should be able to see that the block on the right is clearly brighter than the block on the left. The ink used to print this stamp are, on the whole much redder than those used on the stamps with dextrine gum. The stamp on the left is the reddest, and this can be seen most clearly in the shading on the mountains and water. On the Gibbons colour key, the stamp on the left is deep rose lilac, while the one on the right is blackish purple. Under UV light, the ink used to print the stamps on fluorescent paper looks black, whereas the ink on the other printings still looks deep purple. So the inks used on these printings are both transformative, and non-transformative. A white gum with a satin sheen, as shown on the block above. A dull, white gum with an eggshell sheen, as shown on the bottom block. 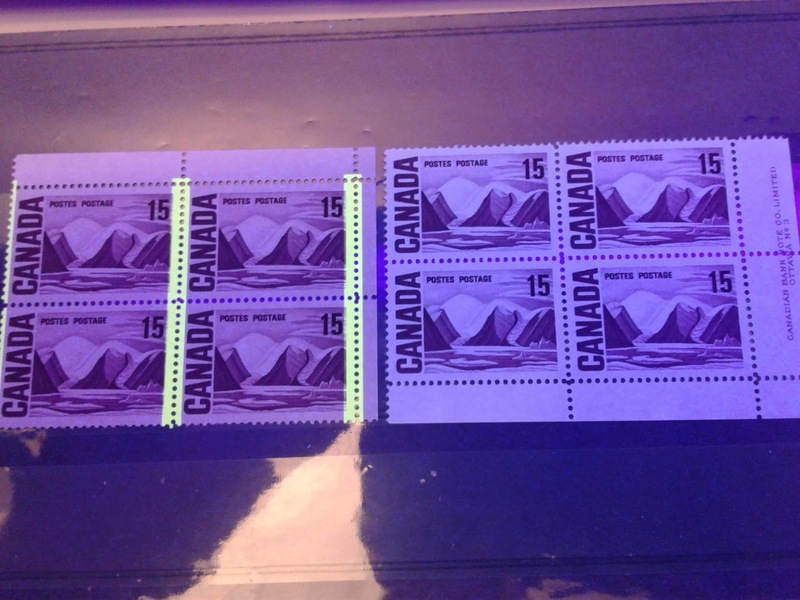 Generally, I have found that the plate 3 printings on the fluorescent paper exist only with the first type of gum, while the tagged stamps exist with the second type of gum. On the stamps I have examined, I have found all four perforations: 11.95, 11.85 x 11.95, 11.95 x 11.85 and 11.85. This was surprising as the 11.95 machines should have been completely phased out by 1972. However, it is probable that they were printed in late 1971, and were issued in early 1972. The Winnipeg tagging was applied down the columns between the stamps, and like the other issues, was applied with less space between the columns of tagging bars on the two outer columns, as compared to the inside columns. 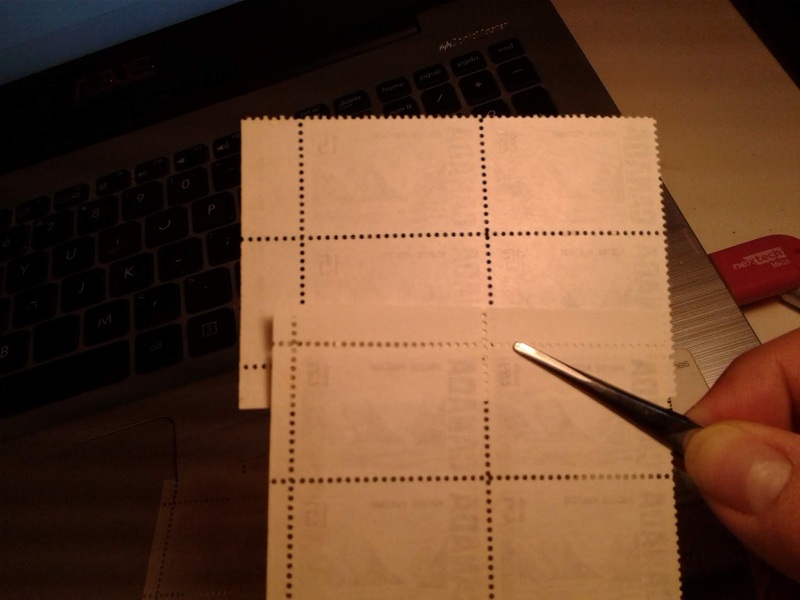 Like other denominations of the issue, the tagging bars are 8.5 mm wide and were applied in the same manner to the panes in the print layout, so that the top panes received the tagging first, followed by the bottom ones. 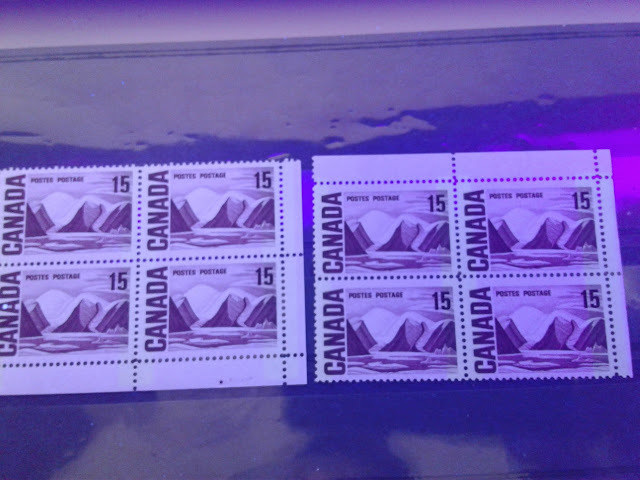 As is the case with other Winnipeg tagging, the intensity of the tagging as it appears in normal light does show some variation, which reflects different concentrations of taggant that was applied to the stamps. The tagging varies from moderately strong, which is just visible as light yellow bands, to strong, in which the bands are very clearly visible as yellow bands. The block on the left is the moderately strong tagging, while the block on the right is the strong tagging. According to Rose, the PVA gum printing exists with W2aL tagging error in which a single wide tagging bar appears at the left side. The intensity of the tagging in normal light varies from moderate, which is just visible, as light yellow bands to deep, which is a deep yellow. The untagged stamps were printed from plate 3 only. I have identified 8 paper types, two shades, two gum types, and four perforations. Thus there could be as many as 8 x 2 x 2 x 4 = 128 collectible stamps, 512 plate blocks and 1,536 blank corner blocks. If you factor in the plastic flow varieties, the number of collectible singles and blocks doubles. 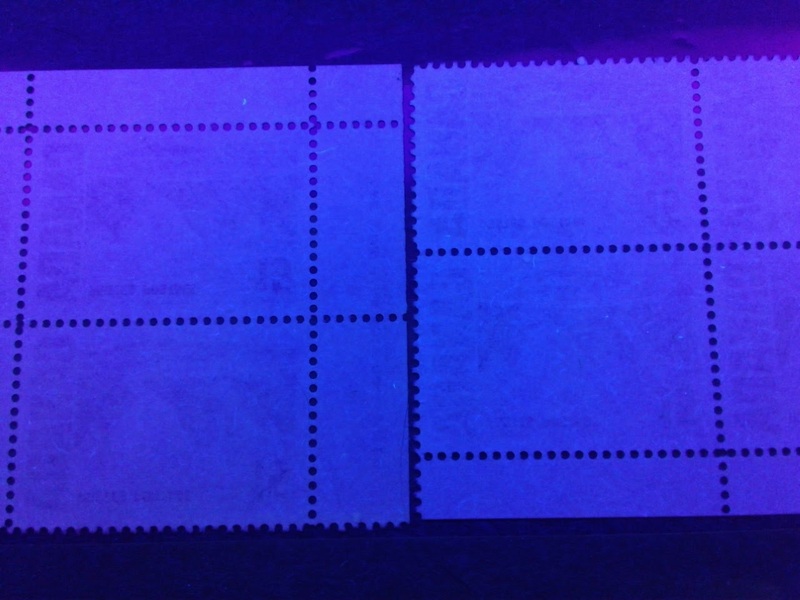 For the Winnipeg tagged stamps, I have identified 4 papers, 2 shades, 2 gum types, and four perforations. Thus there could be as many as 4 x 2 x 2 x 4 = 64 collectible stamps and 768 blank corner blocks. The number is the same for the general tagged stamps. As is the case with the untagged stamps, the number of collectible varieties doubles. This brings me to the end of the 15c value. We now have just four more values to complete the series, so I am getting to the end of a very long and fascinating road. Next week I will explore the printings of the 20c Quebec Ferry. After nearly a year of development, the Brixton-Chrome Website is now live, with approximately 1,830 or so stamp listings from the 1857 Newfoundland Pence Issue through the 1972-78 Caricature Issue. I decided to bring it online sooner, rather than later, so that I could obtain feedback from customers as I develop it and move toward the grand opening. I had originally aimed for July 31, 2018 as my date for the grand opening, but the migration from E-bay is taking much longer than anticipated, so I doubt I will be ready before the end of December 31, 2018. I have moved my estimated date back three more months as of last week because I do not wish to only spend time relocating old E-bay listings, but I wish to list new material as well. That being said, I would encourage you all to visit the site and get acquainted with the layout. Paypal is working now, as are payments by credit card. Item type, i.e. single stamps, plate blocks, booklets, covers, first day covers and cancellations, full sheets, used multiples and varieties. Condition and grade, i.e, mint and used, as well as the major condition grades. Price range - our stamps are organized into 8 price ranges, from under $1 to over $250. The base currency of the listings is US dollars because the software that drives the site is hosted out of California. However, there is a currency translation feature that allows you to select a display currency for all the prices that you see as you shop. My inventory that is currently running live in E-bay will be transferred over to the site over the next several months. By far the most exciting aspect to shopping on the website will be the discounts. We give discounts ranging between 5% and 20% on all orders over $10 USD. Customers who register an account with us prior to July 31, 2018, will qualify for a special discount regime, in which they receive an additional 5% off at every level of discount offered, FOREVER. This means that every single order will be discounted by anywhere from 5% to 25%! To become a registered Brixton-Chrome customer, simply go to the login page from one of the menus located on the home page, at the top, right side or bottom of the page, and follow the instructions. You will need to enter your e-mail address and select a password. I look forward to your feedback. I plan to gather up all feedback received over the next few months, and engage a professional programmer to assist me to make any required cosmetic and functional changes that customers have indicated would enhance their shopping experience.